Here's a new Applemania! recipe that was a big hit at my house. With chilly autumn evenings and apples everywhere, it's a great meal to make in the crock pot and simmer all afternoon. Use organic beans, spices and produce plus free range meat. 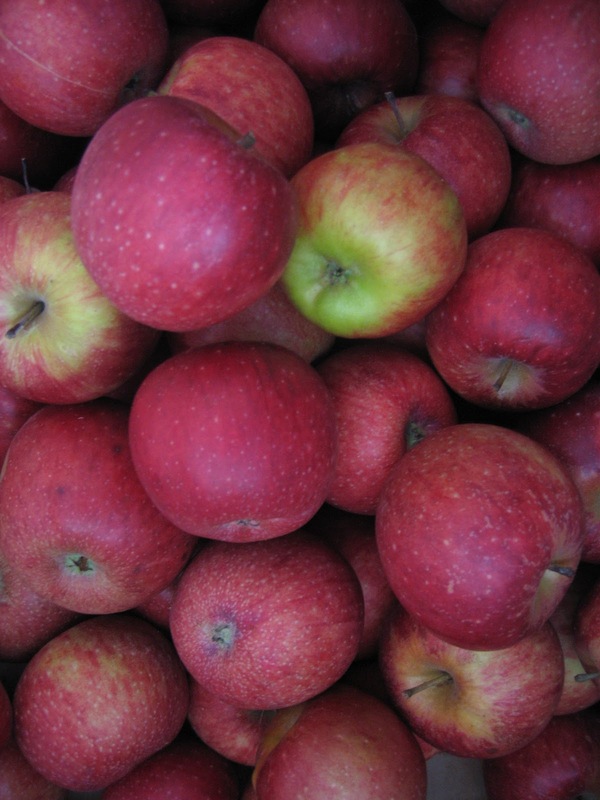 The apples give it a bit of a fresh, sweet taste without adding sugar. Any combination of beans will work but these made a colorful stew. Simmer slowly on stove top or in crock pot for a of min. 2-3 hours. Season with chili powder, cumin, red pepper flakes, sea salt and pepper to taste. For a sweeter twist, add a few chocolate chips or a chocolate kiss to your bowl. You can't really taste the chocolate but it gives it a good flavor. Here's a photo collage of some things that have been going on at our house. I've made it into a grab button for you to add to your site if you wish. Just go to my side bar and copy the code from the box, paste it into a gadget on your blog. Then you'll be able to come right back here simply by clicking on the image! I'd be grateful if you'd share it with your friends. Here's a list of some of the things we've been practicing in our home for years and would like to share with you. We'll also be featuring new things as we learn more and more how to live greener, healthier lives. Bread Baking, the sky's the limit here with yeast breads, sourdough, crackers, flatbreads, etc. 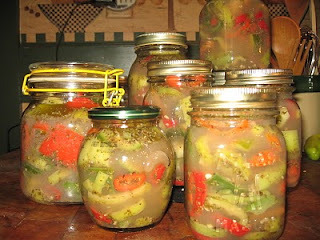 Putting up produce, canning, freezing, drying, pickling, lacto-fermented foods like kimchi, peppers and now sauerkraut. Herbal remedies like salves, lotions, tinctures, syrups, ear candles, teas and more. Homemade, additive free personal care products like facial masks, foot soak, vapor and bath salts, soaps, scrubs, aromatherapy and lots more. We have some experiments in the works! Raw milk and yummy, good for you, whole foods made from raw milk like butter, yogurt, cheese, cream cheese, kefir, buttermilk, whipped cream and sour cream. More whole foods and probiotic drinks like water kefir and kombucha. Herbal and everlasting wreaths and arrangements. 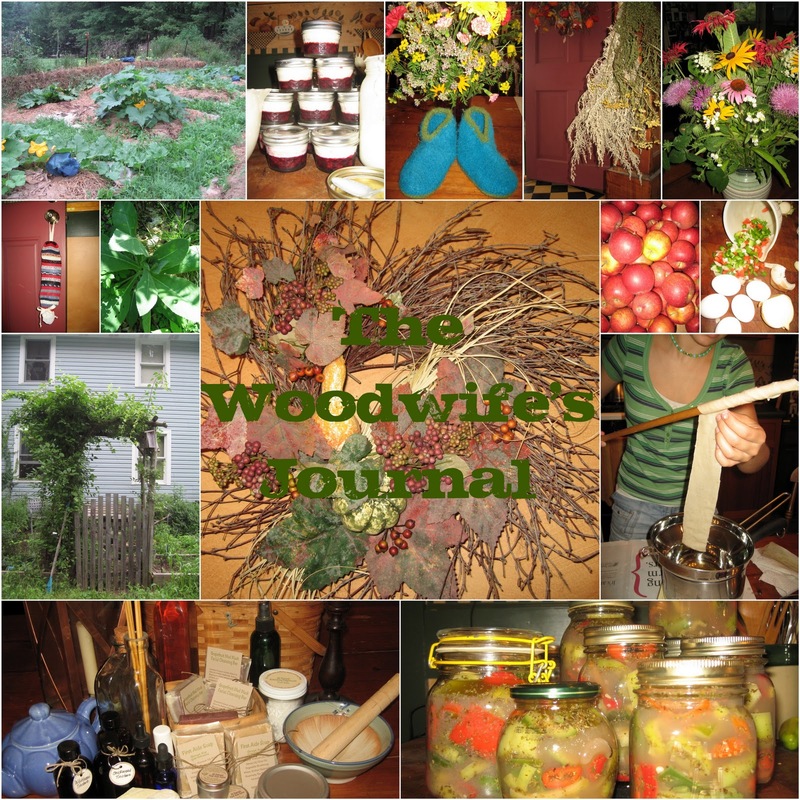 Other hand crafted projects including sewing, knitting, spinning, soap making, jewelry, upcycling, and many more. Hobbies including a bit of F & I re-enactment, gardening, building, maple sugaring, raising free range laying hens, composting worms and lots more. Join us this fall for Applemania! and Pumpkinpalooza! Later we'll feature a few herbal remedies that we like to use in our home. Remember that none of the suggested remedies on this site are intended for medical advice of any kind but merely a faithful report of what we're practicing and the empirical evidence we've gathered through trial and error plus lots of study and research. Be sure to check them out for yourself before using them to treat yourself or your family. All that to say it's just FYI! We're working on some special things for the holidays. Hope you enjoy being here at The Woodwife's Journal. If you're reading and like what you see, drop me a line to let me know how I'm doing. If you're following regularly, it would be encouraging to see that too by following me publicly. You can add me to your reading list by following my blog and when I post something new, it will pop up on your dashboard. Also, if you have a button that you'd like me to share with my readers, let me know about your site and if it goes along with the topics I'm writing about here, I'll put it up with some of my other favorites. Please feel free to comment on my posts and after I've had a chance to read them, if they enhance my blog, I'll post them for everyone to read. If you'd like to share an article you've written on your blog or be a guest author on mine, please let me know and I'll work it out. At this point I'm not sure about setting that up automatically but I'm working daily to improve my site. If you have any pointers, I'd be grateful for your help. Plans are in the works to market some of the things we've been making so watch for that in the future. Check out some things others are doing by clicking the buttons in my favorites list. We're all learning together. This recipe may be one you're familiar with but it's a favorite at our house so I'm including it in Applemania! As usual, please use organic, whole food ingredients if possible. Blend remaining ingredients until crumbly. Bake at 375° for 30-35 minutes. Serve warm. Plain, with a scoop of vanilla frozen yogurt or a dollop of fresh whipped cream. I make the crumb topping up ahead of time and store in the freezer. That way I can whip up a quick treat for unexpected guests or when I'm in a hurry. Check out some other ways to be smart about your food dollars at Pennywise Platter Thursday . 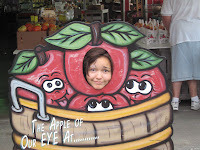 Applemania! 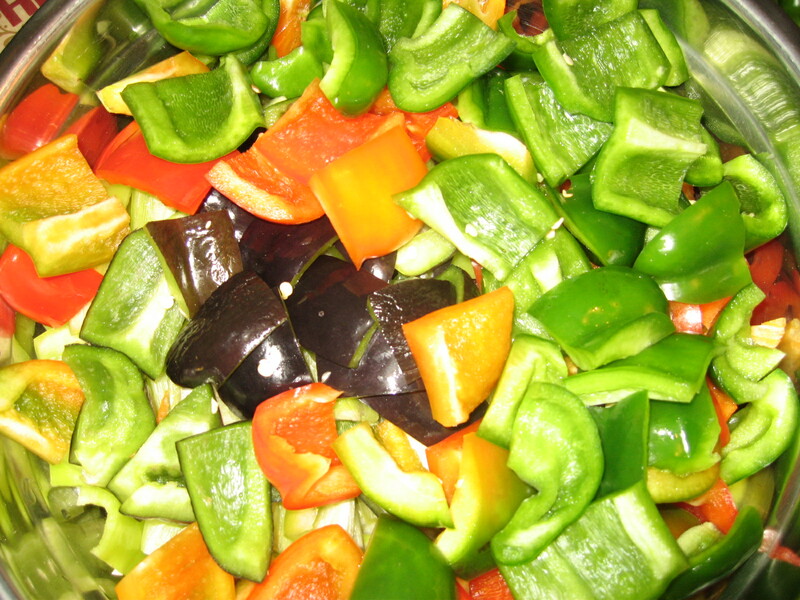 continues with this yummy recipe from my closet blogging friend. This simple dip is delicious with slices of tart apples like Winesap or Cortland. It makes a nice appetizer for a party, afternoon tea or just for fun! As always, we're using the best organic, whole foods ingredients we can find. These are my favorite autumn cookies and right in season for the apple harvest. Their spicy, warm aroma is enough to make anyone's mouth water. Update: Traditionally, I think of this as a harvest recipe but as I read back over the ingredients, I realized that this is a great recipe in Winter and Spring, too because of the healing spices included. Cinnamon is a great warming spice that offers antiseptic, anti bacterial and digestion soothing properties. Allspice is useful for indigestion. Cloves offer antiseptic properties and is a digestive aid. Nutmeg offers digestive remedies for stomach upset and nausea. Add shortening, sugar, egg and water. Roll into walnut size balls roll in cinnamon/sugar. To make drop cookies, add another egg. Yields 2-1/2 to 3 dozen cookies. I'm also sharing this recipe with Sweet as Sugar Cookies for their "12 weeks of Christmas Cookies"
A while back I took a deep breath and made a confession about myself that took a lot of courage to admit. You can read about it at Organizing and Time to "fess" up. I've been thinking about my problem and wondering if I'm any closer to recovery now than I was then. It's not looking good. I think the root of the whole thing is that I'm terribly unorganized. I need to put my ingenuity to work and gather all my stash together in one place where it's easily accessible to everyone and organized so they can see what's available. Yes! That's what I need to do...now where to start? As I mentioned, I have a little here and a little there. I'm speaking generally now and I know I'm underestimating when I say a little. The problem with the organization idea is that I need a staging area. The ugly truth of the matter was exposed when I did a little rearranging in the kitchen and decided to go through EVERYTHING. Let's not even go there! So, what do I do with the things that still have use...are sentimental to me...I dream of using someday but don't because I'm afraid I'll break them...are too fancy for our everyday life but I don't want to get rid of them? Maybe I can justify hanging on to some of this "stuff" if I change the way I look at our daily life. Why should I save my "good" dishes for Christmas? Why don't I get out the luncheon plates and punch cups just for fun? And even though my girls are older, and maybe they'd enjoy it more because they are, why don't we have tea parties as often as we used to? Yes, if I think about it long enough, I can find reasons to put most of the things back in the buffet and china closet. But I have to take credit for getting rid of one fancy dish that we've had for a long time and never used. So that's something, right? And here's another issue I'm struggling with. When I was about 10 years old, I started collecting salt and pepper shakers. Once people know something like that about you, they are more than happy to help! So I have this wonderful collection of hundreds of cute, whimsical salt and pepper shakers that I haven't looked at in about 10 years or longer because I don't have anywhere to display such a large collection. So, do I keep them all packed away or do I get them out and rotate them through the house? Or do I pick out my favorite ones and sell the rest on ebay? I hate to part with many of them because some are souveniers and others were gifts. Some of my favorites were picked up at yard sales and flea markets. I'm serious about forming a PRA group for those who share my problem. Pack Rats Annonymous. Any ideas for overcoming this bad habit? Or better yet, any support to ease my guilt? My husband is not sold on the homemade yogurt I've been making each week, preferring to buy a name brand organic with fruit on the bottom to take in his lunch. Sooo..of course the wheels were turning... and I decided to try making my own. I'm using 4oz. canning jars which may be a little small but the jelly jars are a little too big for an individual serving. We had some blackberries in the freezer so I used a bag of those with a little sugar and cornstarch to thicken them. Because the fruit was hot, the yogurt wanted to mix right in with it which would be fine but wouldn't look as nice as I'd hoped. I put a TBSP of the fruit mix in the bottom of each jar and popped them in the freezer. After about an hour, they were nearly solid so I filled the rest of the jar with a batch of homemade yogurt, topped each with a lid and ring. Voila! My own fruit-on-the-bottom yogurt! We'll see how well it goes over with the skeptics! 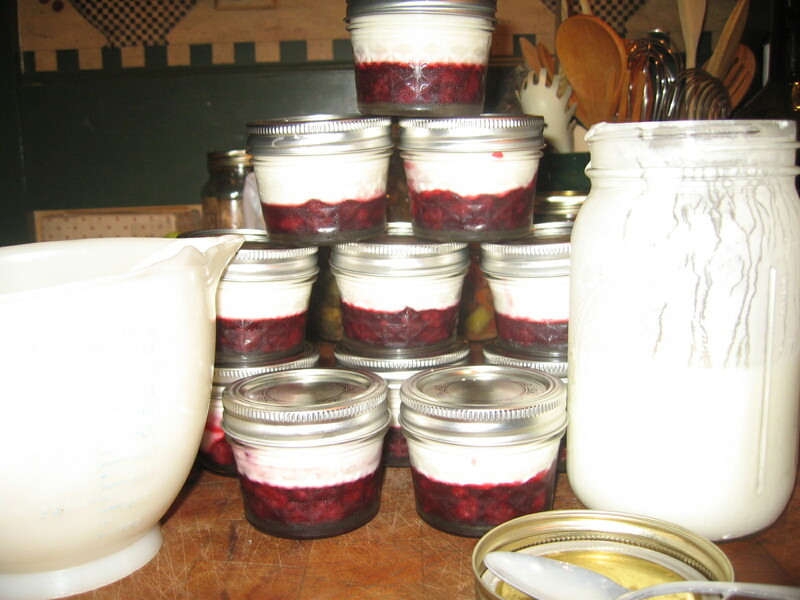 You can find the recipe I use to make yogurt from raw milk here. Here's a recipe from my friend Arlene that we've been enjoying for years. 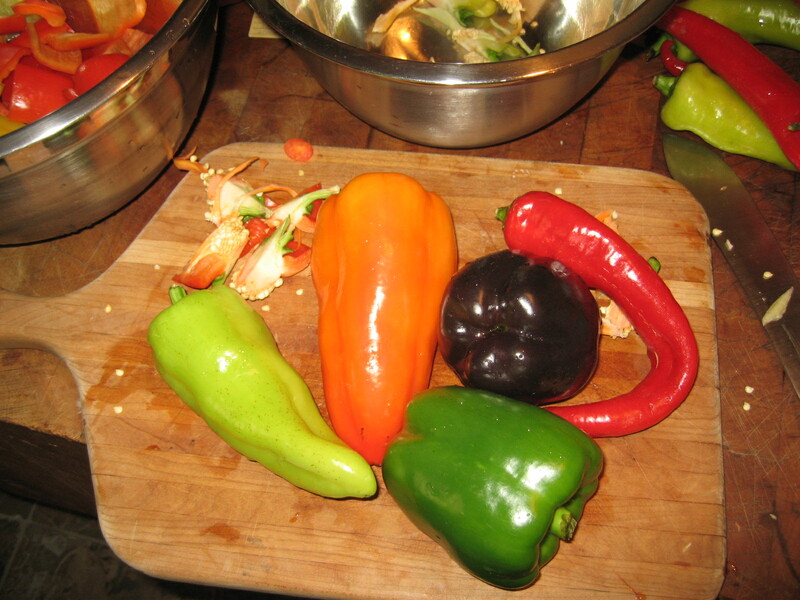 This year, my friend Harry harvested a lovely variety of peppers from his garden and was kind enough to share some with me. These are tasty on a saltine or any cracker of your choice. the sweet peppers into squares. Mix well. Let stand over night. Pack into jars. Seal tightly. Store in a cool dark place. The beauty of this recipe is that no canning is required. The ingredients meld together in a crisp, warmly tangy brine. Because I'm using active cider with the mother, there are enzymes at work making this sort of a pepper kimchi...a lacto-fermented food. To further the enzyme activity, I've added a bit of whey from my last batch of yogurt cheese to the refrigerator jar on the left. Because of the whey, this jar will need to be refrigerated or stored in a cool root cellar after fermenting at room temperature for 3 days. I've just added this post to Real Food Forager's Probiotic Challenge. Fight Back Fridays blog carnival hosted by Food Renegade. and Fermentation Friday where they are celebrating Traditional Foods! 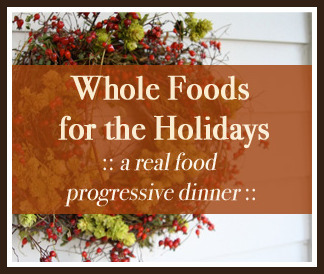 Watch for some of my favorite whole foods recipes in the next month as we gear up for the holidays. Treat your family to some special treats that are fun and good for you, too. Using ingredients as close to their natural state as we can find, we'll whip up some special meals together. Let's start off with my whole grain crackers. Mix all ingredients adding the extra water 1 TBSP at a time as needed. Roll out in very thin layers on an ungreased cookie sheet. My sheets have ridges all around so I flip them over and roll out on the back. Score or cut into squares with a pizza cutter. Prick each cracker a few times with a fork. Bake at 350°F for 30-35 minutes or until crisp. The outside crackers may need to be removed from the pan and the others returned to the oven for a minute or two longer to brown. These are great topped with course sea salt and dipped in homemade yogurt cheese and chopped olives! You can find my recipe for yogurt cheese here. More yummy variations to follow. Now if I can figure out how to add buttons and banners to my side bar, I'll be off and running! My daughter is home from college for fall break. She's missed gardening and harvesting, although there wasn't much, so we went out together to gather what was left. We brought in 4 pie pumpkins, 2 huge candy roaster squash, a few straggling zucchini, 2 odd gourds and 3 more spaghetti squash. I'm glad she had the chance to be a part of that because she put so much care into the garden before school started. Now it's time to start making plans for next year's garden. Bring on the seed catalogs! My lasagna beds will need more layers with a little more density to prevent them from drying out too quickly if we have a dry spell. But all in all, I was pleased with them. The straw bale beds left a little to be desired but I think they just needed to decompose more before being planted. Now they are starting to perk up and look a little more healthy. In hindsight, a little lime may have helped. But I have time to think about it and decide what I'd like to add for next year. I'd like to start a regular compost bin too. We had one years ago but I need to build one with two bins so I can turn the piles easier. I'm planning to put in an outdoor worm bin because my population has outgrown the large plastic tub. I think I'll keep the tub in the garage for winter feeding but I'd like to move the majority outdoors. It's amazing to watch what happens to all the kitchen scraps in just a short amount of time. If you have kids in your home, you should start a worm bin with them to turn scraps into vermicompost. There are some wonderful books out there by Mary Appelhof. She's written books for educational means that work really well in a homeschool environment. And if you are a Gary Larson fan, his book "There's a Hair in My Dirt! ~ A Worm's Story" is sure to bring a smile to your face and a giggle from the kids. If you are interested in any of these books, I'd appreciate it if you'd consider purchasing them from the Amazon link on my blog. I've included a lot of my favorite gardening and herbal books on the scrolling list that links directly to Amazon. If you decide to purchase the book from there, the cost to you is the same but I earn a few cents for each one. Since the early morning temp here in rural PA was 39°F yesterday with threats of the first frost of autumn, I harvested some of my herbs to dry for winter teas. The house smells of mixed mints, lemon balm, stevia (not sure how much fragrance but, oh, how sweet the taste), sage and horehound (meh, not so good to smell or taste but great for a cough). In the dehydrator, they dried so quickly. I also brought in the fennel heads to dry in a paper bag to catch the seeds. Alas the nettle seems to have died off for the season so I'll have to make do with what's already dried. This morning the temp was 44°F so we have another day. There's so much more that I could harvest but some will stay hardy under the colder temps and even snow so I can harvest them fresh as needed.